The 1961 war classic appears to be in the works for Blu-ray! 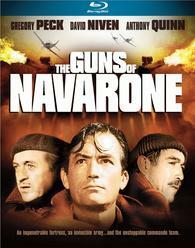 In an early announcement to retailers, Sony says 'The Guns of Navarone' is planned for an upcoming Blu-ray release. Specs, supplements, and a release date have not been set yet, but suggested list price for the Blu-ray is set at $19.95. You can find the latest specs for 'The Guns of Navarone' linked from our Blu-ray Release Schedule, where it is indexed under PENDING.